Townhall this week had the scoop on the Hillary polling and it's not good news for the former first lady. Her ratings are underwater in a recent poll. But there's also another important takeaway from this. 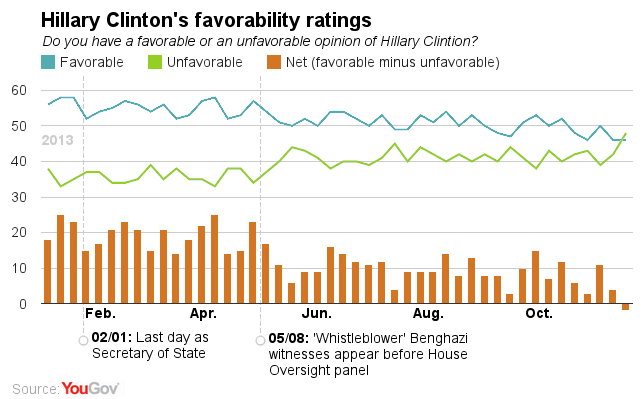 For the first time in years, more Americans find Hillary Clinton "unfavorable" than "favorable" - although she is still the clear leading potential Democratic nominee for 2016. The change is likely due to a plethora of recent bad press around the Benghazi scandal, despite the fact that reports from The Weekly Standard, ABC News, and CBS News were later debunked and retracted. Firstly, Hillary's unfavorable numbers have made moves in the wrong direction (for her) on two distinct occasions. The first time was during the Benghazi scandal - more on that later. The second poin where her unfavorables jump t is around the time of Obamacare's horrible roll-out. She's suffering from the fallout of that by association even though she tried to avoid being associated with it throughout it's lifespan. Everyone knows she backed it, she tried to enact HillaryCare back when Bill was president. She cannot distance herself from it completely, nor will she want to do so - she has to maintain the liberal base of the party in her camp. Yet it could be major concern for her in the general election even if she manages to win the primary by not repudiating Obamacare. These two critical shifts may or may not be reversible but represent a big problem for Hillary's 2016 aspirations (assuming the YouGov poll is not an outlier, which remains to be seen). Back to Benghazi. I've included the links about part of the story being debunked and retracted. It seems as if the seeds are being sewn to show that there was no scandal whatsoever surrounding Benghazi. The CBS news scandal in particular has taken on a life of its own about shoddy journalism. But in 3 years if Hillary Clinton is able to point back and say 'that was inaccurate press coverage back in 2012, go back and look at the retractions and the stories that were debunked' she can win the argument. But it won't be on facts. Shoddy journalism aside, it does not change the fact that the Benghazi attacks caught the State Department off guard and unprepared. Whose fault is that? The fact that the White House and indeed Hillary Clinton attempted to blame this on a video and downplay any terrorism aspect to the attacks is still a shameful scandal. The fact that 4 Americans are needlessly dead is not a phony scandal. The sideshow into who on the ground said what is not as important as what wasn't done leading up to, and during the attack on the embassy. that has State Department, ergo Hillary Clinton, written all over it. And for that her unfavorable ratings do not deserve to recover. For once, shoddy journalism worked in favor of the GOP, and they should not shy away from taking advantage of it the way Democrats routinely do. The underlying scandal is still very real.